On 30 May 2017 guests of Taste of Le Cordon Bleu Adelaide enjoyed an evening with our chefs and students showcasing their skills in the service of a delicious three-course tasting menu. Le Cordon Bleu representatives spoke about our world-class Le Cordon Bleu programmes sharing industry insights on culinary, gastronomy and hospitality management education, current industry developments and graduate prospects. Sarah Stephens (Regional Officer, Sales/Marketing) warmly introduced the evening, and gave an informative marketing presentation. 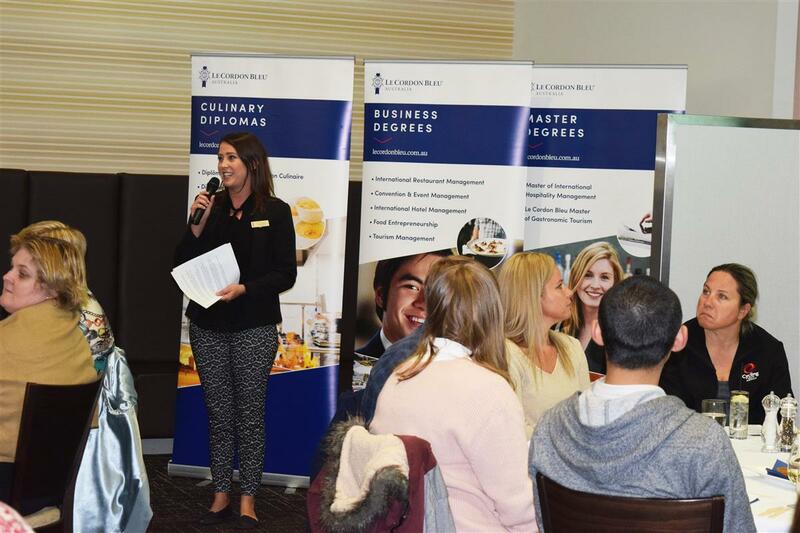 Le Cordon Bleu Career Services representatives Kerry Watton and Anthea D’Aloia discussed the extensive support offered to our students, including our industry placement programme (Work Integrated Learning) and Le Cordon Bleu’s expansive industry partner network. 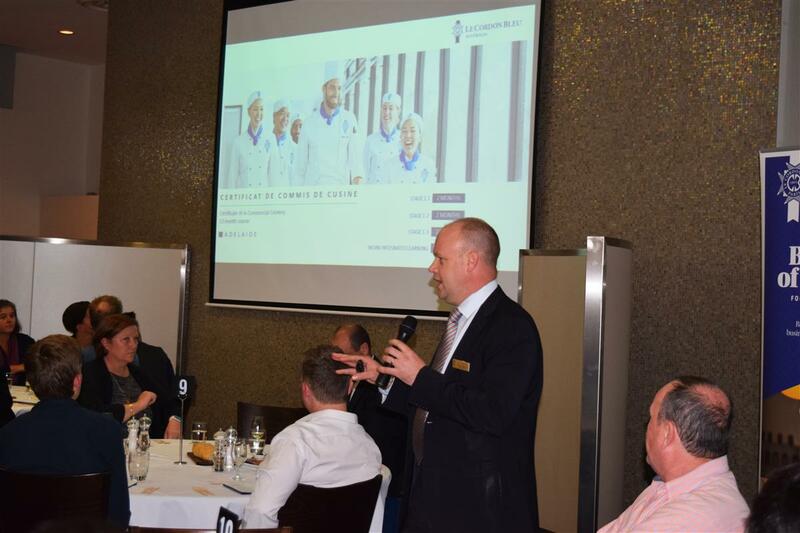 Programme Manager Luke Montgomery and Lecturer/Sommelier Trevor Maskell entertained and informed, discussing the distinctive teaching methodology at the foundation of Le Cordon Bleu programmes. Chef Simon Taylor spoke about menu design and the high standard of culinary training Le Cordon Bleu provides. Our participating students conducted themselves superbly, their professionalism and skill acquisition clearly evident in a busy restaurant serving 100 guests. 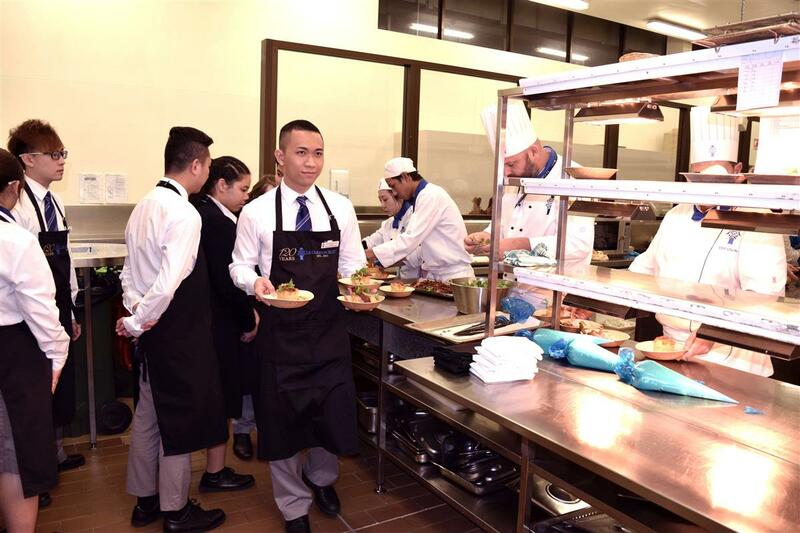 Bachelor of Business students excelled in front of house, while students from Certificate III in Commercial Cookery skilfully attended to food preparation and service. Guests enjoyed a sensational three-course tasting menu consisting of Pan-Fried Atlantic Salmon Tabouleh, Cucumber Noodles with Sauce Vert & Crème Fraiche; Navarin of Lamb Pie with Petit Pois à La Francais, Pommes Purée and Crisp Speck; and Baked Vanilla Cheesecake with Rhubarb, Lemon Curd and Crème Chantilly. The menu was delightfully accompanied by matching wines expertly chosen by Lecturer/Sommelier Trevor Maskell. We invite you to experience the next Taste of Le Cordon Bleu on 21 November in Adelaide. This complementary event is an informative and enjoyable evening to introduce you to the world of Le Cordon Bleu.